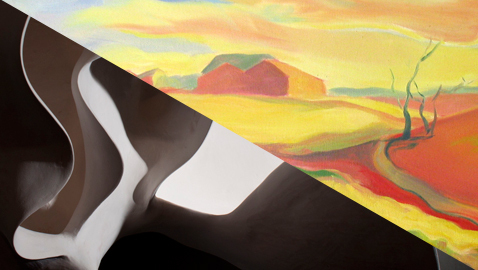 This weekend’s senior Studio Art exhibition features the work of Kathryn Gonzalez ’12 and Elizabeth Laplace ’12. Their artwork will be displayed together in List Gallery from May 10th to the 13th. The opening reception is today (Thursday the 10th) from 4:00 to 6:00 p.m.
Gonzalez, a painter from Los Angeles, California, works with oil paint on canvas. Her exhibition is titled Transitions. “I have been particularly focused on transitional times of the day — at sunrise or sunset, or when light is moving through clouds,” said Gonzalez, who specializes in landscapes. For Gonzalez, who works both on-site and from photographs, painting is an attempt to translate “the visceral impact” of the real-life scene. Gonzalez’s paintings demonstrate her love of color and shape. She explained that she often breaks down her sketches of places into basic relationships of light and dark, and then pieces the sketches back into a full landscape. Laplace forms her sculptures from paperclay (clay combined with paper pulp) to build delicate, fluid pieces. She examines plants and breaks them down into shapes, then rebuilds those shapes slowly and carefully into forms from her imagination. The exhibition is free and open to the public during regular List Gallery hours. All are welcome at Thursday’s reception. Click here for a complete schedule of the 2012 Senior Thesis Exhibition Series.